You have added Pale Tangerine Embroidered Salwar Suit in Digital Print Cotton Silk with Pants & Banarasi Weave Dupatta to your Shopping Bag! 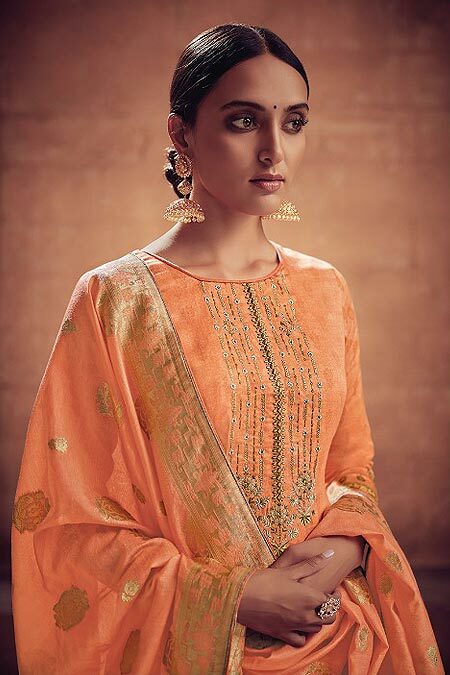 Bring in some tangerine twist to your wardrobe with this pale tangerine orange cotton silk salwar kameez teamed with Banarasi weave dupatta and straight pants. The digital print straight cut kurti is adorned with beautiful floral thread embroidery to front bodice. Banarasi weave dupatta with tassels completes the traditional look. Accessorise your look and you are ready for any special occasion. 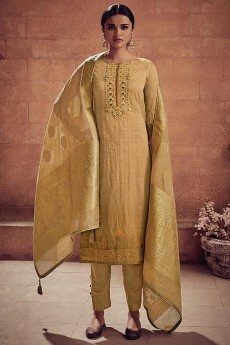 Peach Embroidered Salwar Suit in Digital Print Cotton Silk..
Earthy Beige Brown Embroidered Salwar Suit in Digital Print..